Vision Development can design and build a variety of buildings from oak frames giving a beautiful traditional look and feel to the structure. We can build complete houses, extensions, conservatories, out buildings, garages and garden offices based upon oak portal frames. The traditional approach is to construct a frame (also known as a portal) from solid oak beams. The fabric of the structure (which could be wood, brick or glass) is then constructed between the oak beams. As well as traditional oak frame structures we can also create a timber frame structure with oak features and portal extensions. This results in considerable cost savings as solid oak is expensive and takes more time to erect. For this approach, we would construct the building using our timber frame panels and then add parts of oak beams. This still gives the appearance of a beautiful traditional oak frame structure but results in substantial savings in both materials and labour. The drawings on the right show how this works. The top drawing shows a traditional oak frame building and the bottom drawing shows a timber frame building with oak features. 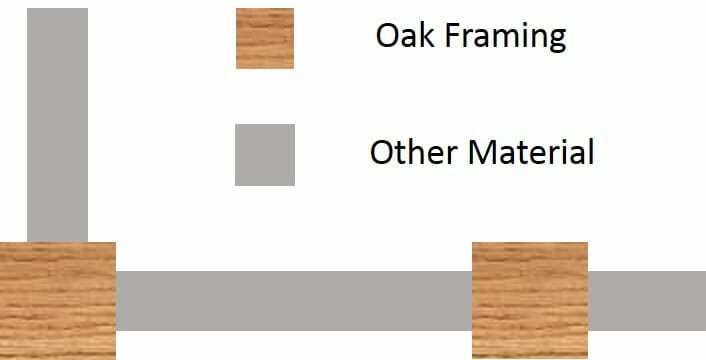 Note that on the lower drawing less oak is required as it is added as cladding to the timber frame structure only in places where a traditional oak portal frame would be visible. Below is a gallery showing a variety of oak frame structures that have been built by us. For more details contact us, call us on 0118 971 2181 or email us. Click on the button below to see articles about oak frame buildings.